I’ve been just _wallowing_ in this book for several days. Rickman is one of my favorites; he has the sort of characters you know and treasure, who have reality and depth and get deeper as they go along. To say nothing of flat-out wonderful, evocative writing, terrific plots, and a marvelously creepy strand of the supernatural twining like smoke through the story. THE SECRETS OF PAIN is the latest in his Merrily Watkins series. The Reverend Watkins is an Anglican priest, widowed, with an unpredictable teenaged daughter—and is the official Exorcist (though the Church now prefers to refer to her discreetly as a “Deliverance consultant”) for the Diocese of Hereford. Merrily smokes like a chimney, is having an affair with the emotionally-damaged rock musician across the road, and wrestles constantly with the knowledge that most of the world thinks what she does is irrelevant at best and at worst, insane. THE SECRETS OF PAIN involves—as one might expect—secrets of various kinds. The Official kind—Hereford is the homebase for the SAS, one of the most elite and secretive regiments in Her Majesty’s armed forces—the political kind (wherein the forces of commercialism and modernity threaten the increasingly fragile tradition and history of a very old part of the country)—and the supernatural kind, where “men with birds’ heads walk out of the river mist” and a _very_ old and bloody religion proves not to be quite gone. Besides the wonderful characters and story-telling, what I like best about Phil’s work is the ongoing conversation throughout the series between religion and secular society, the subtle questions about the nature (and power) of belief. These are beautifully layered books, that can be re-read periodically—and the release of a new one is always a great excuse to go back and start all over with the first volume, THE WINE OF ANGELS. Which I propose to go and do, directly I finish work tomorrow. 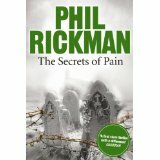 Thank you for the suggestion on Phil Rickman. I just picked up Wine of Angels today and will start it tonight (DH is in Jamaica, so I have plenty of free time!). Every year around February, I ache for both a religious AND religiously thought-provoking (if not downright shocking) books. Am currently finishing an eye-rolling nonfiction about the historical Jesus, but your description of Secret of Pain sounds like it would fill the bill for my February theme. I love your methadone list, Diana. You’ve opened my eyes to so many great books, none as marvellous as yours though. Oh, and I just turned a buddy from NE Ohio on to your books, your Facebook page and website. I’m glad to report, she’s ignoring her family and is now on Voyager. She began Outlander a week ago . I became aware of Phil Rickman’s books and Merrily et al. a few weeks ago, and since then have read everything he has written that is available to me. I am very eagerly waiting for the next one, meanwhile I can go back to Jaimie and Claire. Thanks to you both for being such fantastic and prolific authors, – keep ‘em comin!!!!! About a year ago, I started reading your fantastic books and I’m currently reading An Echo in Bone. I just want to tell you that I wish you would come to Sweden some time, we would love to see you here. Wow! This sounds like such a good series! Thanks so much for the review and for bringing this author to my attention. I’m heading over to Amazon right now to pick up the first book in the series I’m a somewhat lapsed Catholic/a new Christian and I really love books where they show flawed characters. Where you said “the ongoing conversation throughout the series between religion and secular society, the subtle questions about the nature (and power) of belief” really piqued my interest, too!! Diana, thanks for putting me on to this series. I’ve now read the first two and I’m going to be hard pressed not to race out an buy the next one straight away. I really should let them digest and settle and savour them slowly. I love the characters, even the minor ones are fleshed out and real. And they’re all ever so slightly odd. Is there any chance that your short stories will be published separately as e-books? Perhaps for $.99 or $1.99 as Kindle Editions? Or maybe pull all Outlander-related short stories together as an e-book for the price of a normal book? I would love to read them, but am unlikely to purchase all these separate collections. Or really, any of them. But I would certainly buy a collection of YOUR short stories. Yes, there is–but it’s slightly complex, in that when a story is published in an anthology, there’s an “exclusivity period” during which it can’t be reprinted elsewhere. So we have to wait for those periods (of varying lengths) to expire for the different stories, because we can contemplate e-publishing them. Since I heard you mention Phil Rickman in the interview during the L.A. Outlander fan event, I’ve been through 5 of his non-Merrily Watkins books and I have two more to go. Thanks so much for introducing me to this author! His stuff is delightfully creepy, and I agree that his characters are quite compelling!